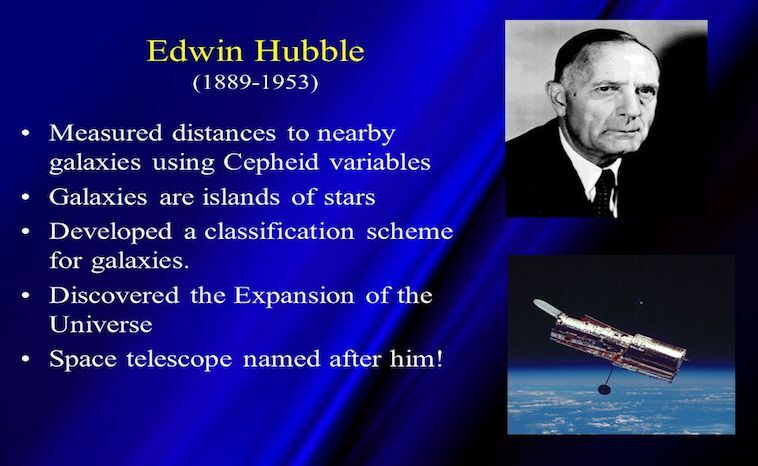 We know that NASA has the Hubble telescope and that is was named after Edwin Hubble. Who was Edwin Hubble and what discoveries did he make? Read on to learn more. Born in Marshfield, Missouri on November 20, 1889, Edwin Hubble began reading science-fiction novels at a young age. One of his favorite books was Jules Verne’s 20,000 Leagues Under the Sea. In 1898, when he was ten years old, Hubble and his seven siblings moved with their parents to Chicago, Illinois. There, Hubble attended high school and excelled at sports, particularly track and field—as a high school student, he broke the Illinois state high jump record. Although he completed his college degree in law, Edwin went back to school a few years later to get his doctorate in astronomy. This decision forever changed scientists view of our galaxy. Once he got his doctorate, the Mount Wilson Observatory in California invited him to work for them. However, he enrolled in the Army and served during World War 1. After he got out, he took up his position at Mount Wilson and began a long career in space exploration. In 1908, an astronomer named Henrietta Leavitt had discovered a relationship between the period and luminosity of a class of pulsating stars called Cepheid variables. By timing its period, astronomers could work out the actual luminosity of a Cepheid. Therefore, by comparing the real luminosity with the observed brightness, they could work out its distance. In the 1920s, Edwin Hubble made history by looking through a 100-inch telescope at Mount Wilson in Southern California. Training his gaze on the Andromeda Nebula, he saw stars similar to ones in our galaxy, only dimmer. One of those stars was a Cepheid variable, which astronomers could use to measure distances. The discovery of the Cepheid variable allowed Hubble to deduce that the Andromeda Nebula was not a nearby cluster of stars, but an entirely different galaxy. By the 1930s, most astronomers had been convinced that the Milky Way galaxy was but one of millions in the universe. The very notion that there was more than one galaxy in the universe was revolutionary. He continued measuring distances and velocities in deep space, finding that the further apart galaxies are from each other, the faster they move away from one another. His findings, published in 1929, led to the widely accepted notion that the universe is expanding. Albert Einstein personally thanked Hubble for the support his conclusions gave to his theory of relativity. In studying the various galaxies, Hubble was able to determine that they did not sit stationary in space. Instead, it appears that every galaxy seems to be rushing away from Earth. However, the Andromeda Galaxy is instead rushing toward us and will collide with the Milky Way in about 5 billion years. Furthermore, astronomers tested his calculations on other galaxies and found that some were moving quickly. They believe that some are moving 90 million mph (40,000 kilometers per second) in the opposite direction. The calculation to determine the rate at which the universe is expanding is known as Hubble’s law. This estimate was initially proposed by Georges Lemaître in 1927. According to the calculation, the universe is growing at a constant rate, known as the Hubble constant. In 1990, 101 years after Edwin Hubble’s birth, NASA launched the Hubble Space Telescope. It has shown galaxies in all stages of the universe and played a vital role in the discovery of dark energy, the force causing the universe to expand. Thanks to the efforts of this great thinker and scientist we continue to increase our knowledge of the universe.